Need Help After a Truck Accident in Colorado? Commercial truck accidents are typically more complex than passenger car accidents. The destructive force of a semi-truck can demolish more property, inflict more severe injuries and result in more wrongful death cases. Due to these dangerous outcomes, commercial trucks carry high levels of insurance. Commercial truck companies use insurance companies to vigorously defend accident cases and avoid costly payouts. Finally, state and federal regulations govern commercial trucking activity. Many cases are won or lost based on the intricacies of trucking law. In order to combat this, it is important for you to hire a trucking accident attorney who has experience with truck accident lawsuits. Our attorneys understand the importance of anticipating the moves of the defense and will work hard to procure you an acceptable financial settlement. At Lampert & Walsh, LLC, we have detailed knowledge of trucking accident law and are highly experienced in civil court. Since 1979, our firm has dedicated our practice to resolving tough motor vehicle and truck accident cases. Due to our decades of service, we have developed a reputation as one of the premier personal injury firms in Denver and Aurora. Our attorneys have experience providing clients with personalized legal services. When you bring a truck accident lawsuit to our firm, you will be treated with respect and can expect to receive a positive legal outcome. If you or a loved one have been injured in a commercial truck accident, then you should retain the services of our Denver truck accident lawyers and let them handle the specifics of your case. How Do Denver Truck Accident Lawyers Determine Liability for a Colorado Crash? Cargo company errors. The companies that load commercial trucks can overload the vehicles or fail to properly balance the cargo. This can result in tip-over accidents when traveling on tight curves or in high winds. Driver errors. Commercial truck drivers work on tight schedules and are prone to aggressive driving. Many crashes can also be traced to driver fatigue or drug and alcohol abuse. Employer errors. The trucking industry is heavily regulated. However, some employers still allow or require drivers to spend more time behind the wheel than the law permits. In situations like this, accidents are more likely to occur. Failing to maintain company equipment can also lead to severe problems. Faulty roadways. Roads that are not designed to accommodate eighteen-wheelers or big rigs can produce accidents. Often times, state and local governments fail to adequately maintain these roads, inviting accidents due to faulty infrastructure. Motorist liability. Many passenger vehicle drivers do not know how to safely share the road with semi-trucks. They either fail to give the trucks enough room to turn or do not leave enough distance for a sudden stop. Do I Really Need the Help of Denver Truck Accident Lawyers? Evaluating your case. It takes specific knowledge to ascertain the value of a personal injury case. Unless you speak to a trained professional, you risk settling for much less than you deserve. Fighting for fairness in court. At our firm, we employ trial lawyers. We do not accept settlement offers unless we think they are fair and our client agrees to the terms. We are prepared to go to court and make our case in front of a jury if necessary. Filing your claim in a timely manner. Typically, motor vehicle accident cases have a statute of limitations of three years. We will make sure to file your claim within the appropriate time frame. We can also inform you if an exception applies in your case. Helping you obtain medical assistance. Our firm works with a network of medical professionals who can provide you with restorative care. This even applies to individuals who do not have insurance. Working with our medical team also ensures that you have accurate medical records to present as evidence in your case. Preventing you from making statements against your interest. When you speak directly to an insurance company representative, you risk making a statement that can be used to reduce your compensation. By having an attorney present, you are actively protecting your own interests. Although hiring an attorney may seem like an unnecessary expense, our firm will work with you on a contingency basis. We do not charge by the hour or demand a retainer. Our Denver truck accident lawyers only recover legal fees if they obtain an agreed upon settlement or receive a favorable jury verdict. This ensures that you are protected financially and are receiving quality legal services. 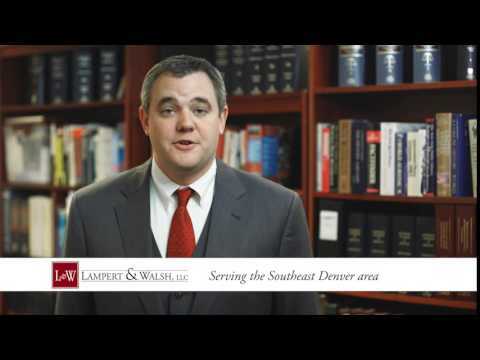 If you have been injured in a truck accident and want to hold the responsible parties accountable, then contact Lampert & Walsh, LLC today at 720-489-5848 and schedule a consultation. The first meeting is free of charge and is a great way for us to review the merits of your case. You can also contact us online through our Denver office and we will get back to you as soon as possible.